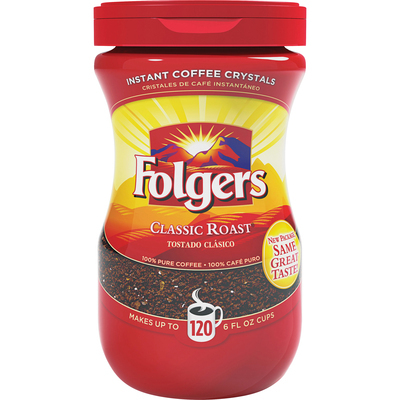 Classic, Caffeinated Coffee Crystals Bring You Rich, Flavorful Instant Coffee. Simply Add Hot Water To Enjoy The Same Mountain Grown Flavor Morning After Morning. Easy-Open Flip-Top Allows Easy Access To The 100 Percent Pure Coffee. 8 Oz. Container Yields Up To 6 Fl. Oz. Cups..
Classic, Caffeinated Coffee Crystals Bring You Rich, Flavorful Instant Coffee. Simply Add Hot Water To Enjoy The Same Mountain Grown Flavor Morning After Morning. Easy-Open Flip-Top Allows Easy Access To The 100 Percent Pure Coffee. 8 Oz. Container Yields Up To 6 Fl. Oz. Cups.